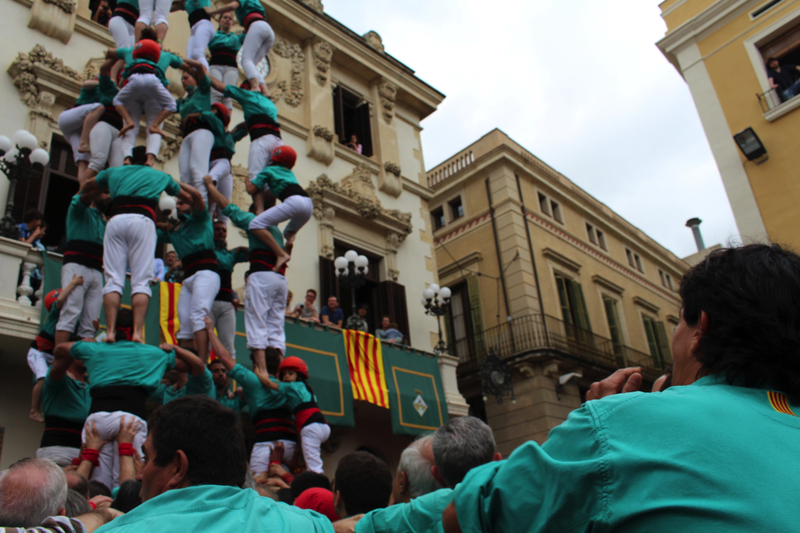 You are about to experience a ‘castell’ (human tower) as you have never done before. All the members of the club seem to breathe as one. Arms form indestructible roots. Each new level is a triumph. 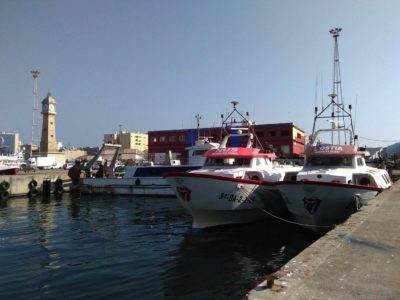 The ‘enxaneta’ raises her hand and you are part of the ‘pinya’, the supporting base of the tower, an exciting experience as we think you will agree. 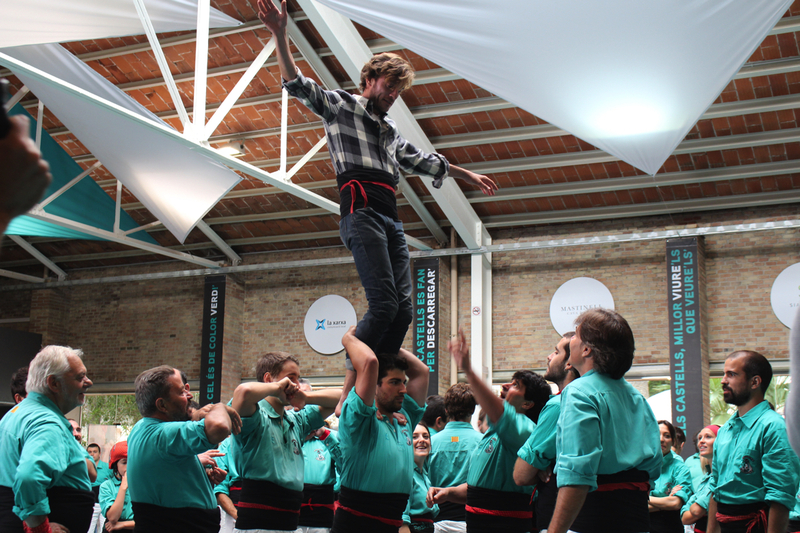 We invite you to be a ‘casteller’, to form part of a human tower. 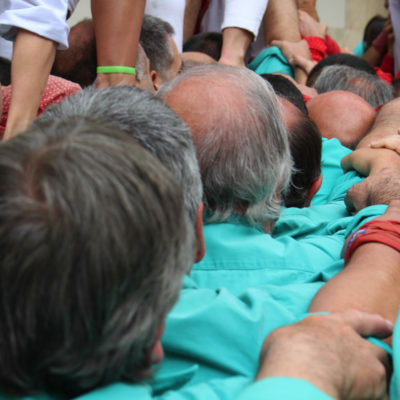 To experience the fervour of the ‘castells’, the human towers, as a member of the group, is something else, a truly magical opportunity. And, to do so in Vilafranca, the city that’s home to one of Catalonia’s most ancient clubs, is a real honour. 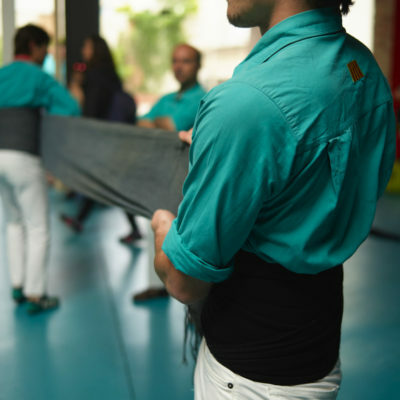 When you enter Cal Figarot, a place that is much, much more than a mere headquarters and rehearsal venue for the Vilafranca ‘Castellers’, you can already feel it’s something special. 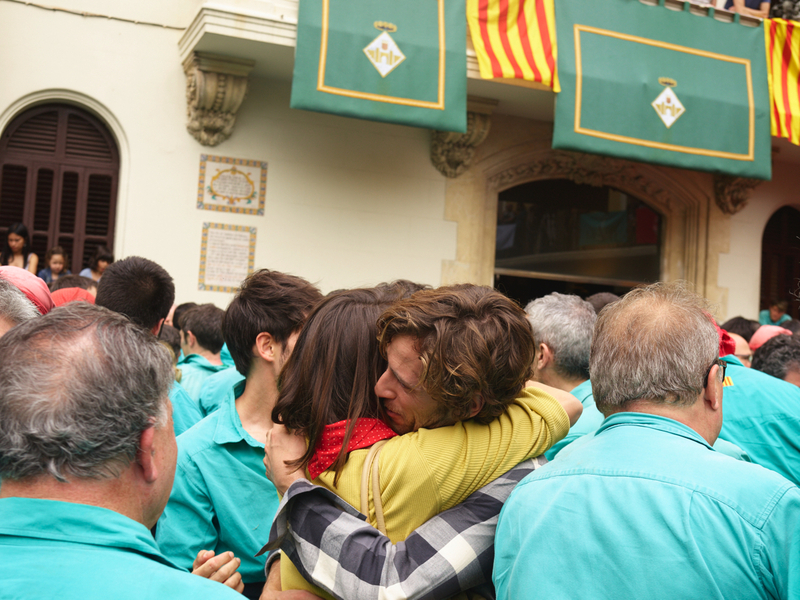 The green-shirted members receive you with the pride of those who know that their ‘colla’ (club) is one of those with the greatest tradition in all Catalonia. 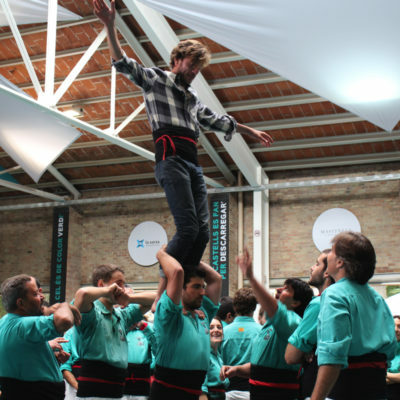 You will have the chance to take part in a rehearsal and to help form part of the base or ‘pinya’. 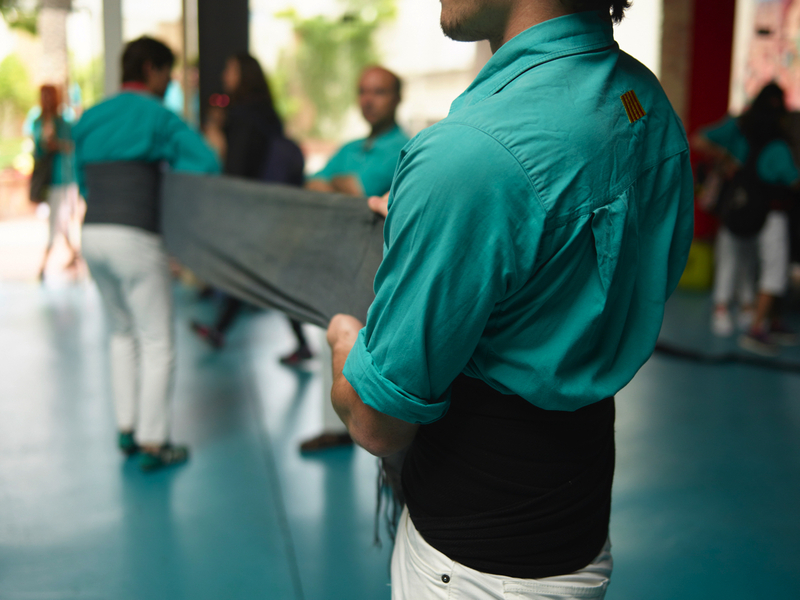 You remove your footwear, wrap the cloth ‘faixa’ around your waist and, with a group of friends, you try to make a tower. 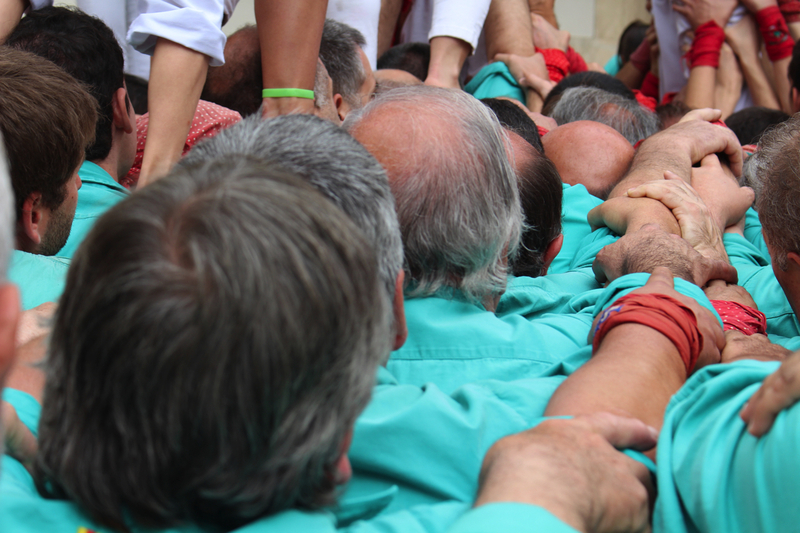 Teamwork takes on a different meaning from the viewpoint of the ‘castellers’. 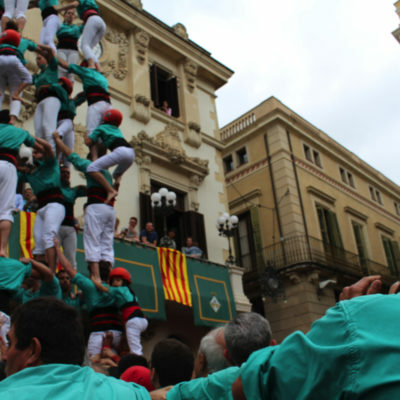 This Catalan tradition has received due international recognition, being classified as Intangible Cultural Heritage by UNESCO. 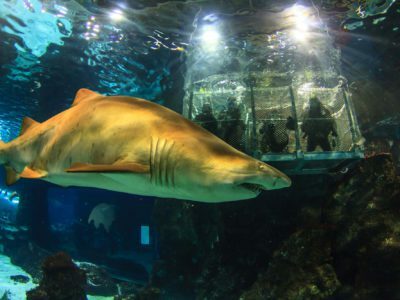 Who dares to be an ‘enxaneta’? 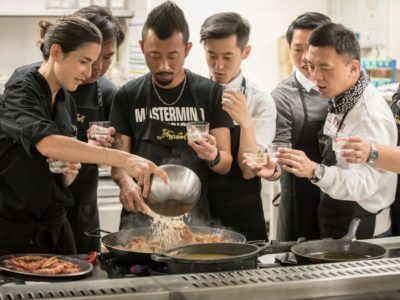 On the day of their performance, the club has a hearty breakfast: white beans with bacon, garlic and parsley, and as much barbecued meat as possible. 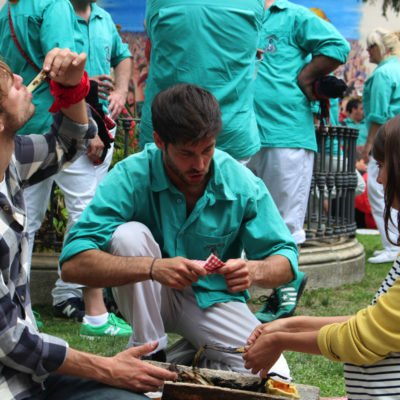 But the ‘casteller’ experience is sure to give you a healthy appetite. ‘Vilafranca Ve de Gust’ is the organisation bringing together the restaurants with the ‘Penedès’ designation of origin. 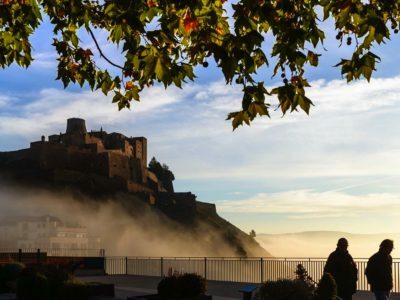 In them, you can try ‘Gall del Penedès’ chicken (which enjoys a protected geographical indication), duck, ‘xató’ salad, oils, dried fruit and nuts, the Ordal peach and, obviously, the local DO wines and cavas. And, have you heard about the traditional local sweet? Seek it out and end your ‘casteller’ day with a final treat! Wine is more than a drink in El Penedès: it’s a way of life. 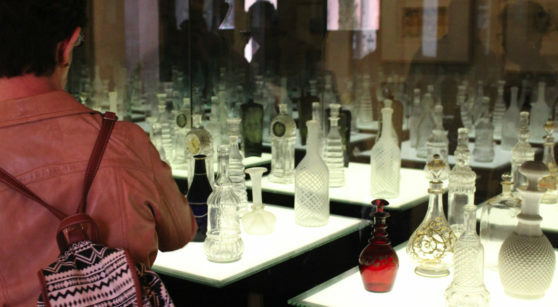 Find out how and why at the Vinseum, which boasts a collection of more than 17,000 items to help build the story of the history of wine and wine culture in Catalunya. 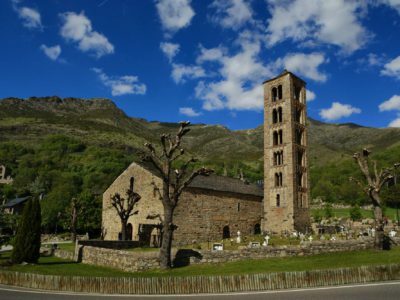 There, you can see the traditional tools and the winery of yesteryear, pottery, archaeological remains and works of art. After your visit, have a bite at the Taverna de Vinseum, managed by Ton Colet, a sommelier specialising in El Penedès wines. 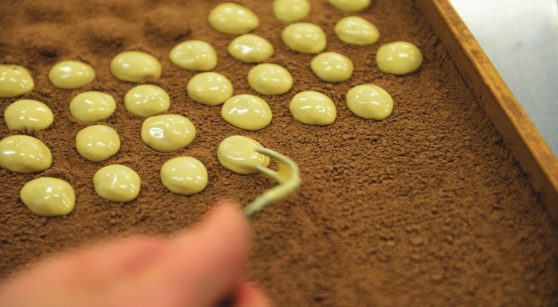 Almonds, praline and cocoa powder come together to make the most treasured sweets of El Penedès: the catànies. Today, you can find them in many pastry shops, but if you want to take a trip to discover the truly authentic ones, you have to go to Vilafranca del Penedès. Take note: two pastry shops stake a claim to be the guardians of the essence of this sweet, by popular acclaim—Cudié and Catànies Via. The original recipe dates back to the 1940s, but, over time, different variants have appeared, such as dark chocolate, yoghurt and coffee. 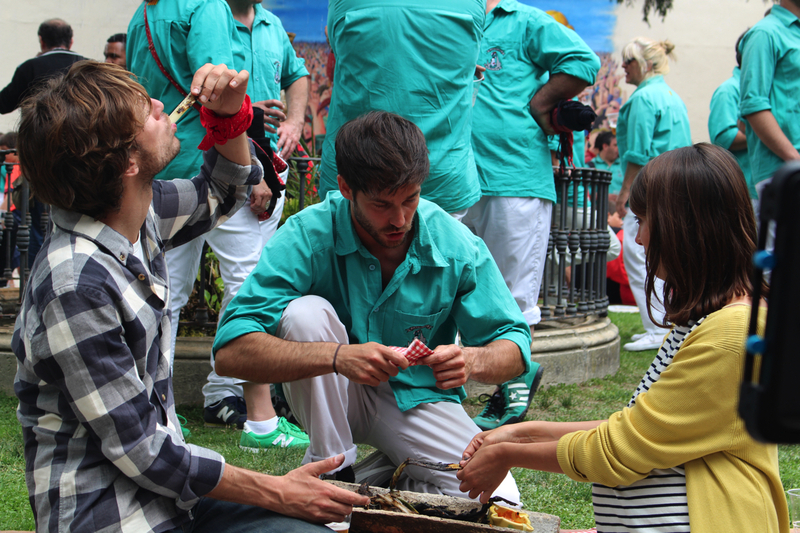 A great morning of making human towers concludes with everyone sat around a table enjoying a calçotada. To make one, the key elements are calçots (a special kind of spring onion) and the accompanying sauce. First, make the sauce. To do this, you must put in a liquidiser the peeled and seeded tomatoes, the peeled garlic, the ñoras, the almonds, hazelnuts and the paprika. Whizz it all together, adding the olive oil, the vinegar and the salt and pepper. 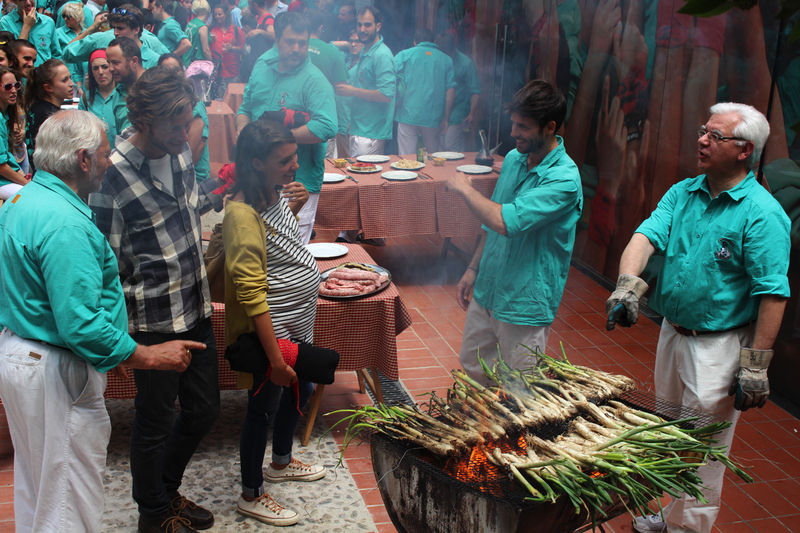 Once ready, set aside and start preparing the calçots. 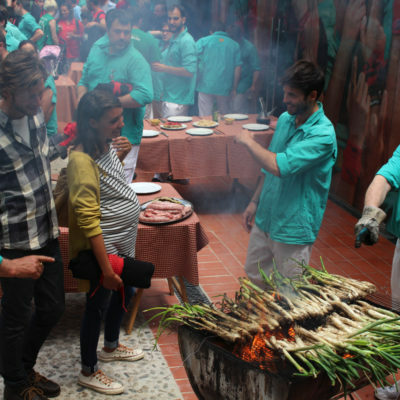 Place the calçots alongside each other on a barbecue grid. If you like you can cut off the roots. Light a fire of vine wood and, when the flames take, put the grid on top and leave until the calçots are blackened, first one side and then the other. Remove and wrap them up in newspaper to finish cooking. Then, all you have to do is peel them, dip in the sauce, and enjoy!